Just over two months ago, I challenged myself to celebrate Vegetarian Awareness Month by going completely vegan. I don’t know why I thought this was a good idea. Typically, I eat more beef than a professional football team and frankly I think vegetarians are missing out on a world of beefy and fishy deliciousness (bird I can do without). While I was determined to stick to my vegetarian guns during the month of October, I assumed come November 1st I would run wild, sampling surf ‘n’ turf meals all around town. So when it was announced that Chef Ludo Lefebvre was opening LudoBites 3.0, a pop-up restaurant at Royal/T in Culver City, I was quick to accept a dinner invitation from food blogger friends. Besides, LudoBites wouldn’t be open until December, which was a long way away--surely I’d be back to my old eating habits by then. There was no way I would survive Thanksgiving with my Middle Eastern family as a vegan without being either force fed turkey or disowned. Or both. November 1st rolled around. Slight change of plans. See, initially I figured I’d immediately pitch a tent (not that kind of tent) inside Taylor’s Steakhouse and never leave. Revised plan: alienate all my meat-eating friends who were ready for me to give it a rest by announcing I still wasn’t ready to abandon veganism. Then came Thanksgiving, where I carefully and discreetly avoided eating any turkey, sausage-laden stuffing, or other meaty dish. And narrowly dodged being disowned. At least this time. See you at Christmas dinner, Dad. The next challenge would be my December 3rd food blogger dinner at LudoBites, the only tangible temptation I’d really had since quitting meat. I’ve eaten out at plenty not so vegan friendly restaurants since my change in diet--Hungry Cat, Cobras & Matadors, Cafe Stella, the list goes on. What was so threatening about LudoBites? Well first of all, knowing Chef Ludo would only be at this location for 15 days impressed a sense of urgency upon me. I couldn’t just try it later when (if) I returned to my old diet. And that’s what’s so genius about his pop-up restaurants. In a fickle city like Los Angeles, he knows better than to give us the chance to get sick of him. He breaks up with us before we can break up with him. And we love him for it. Secondly, I remembered from my experience at the LudoBites 2.0 at BreadBar that nothing would be remotely vegetarian and everything would be incredibly unique--not just another slab of steak I’d had before or a scallop I could find anywhere. And why should we expect any less from a Top Chef Masters contestant? Even if it was a quesadilla that ultimately led to his elimination. What kind of a quesadilla? A pig’s ear quesadilla. There was no way I would find a vegan option on his menu. Was I going to break my two month long stint? Would I eat meat again and give up on veganism completely? My solution, I decided, would be to eat seafood, pick at things here and there, and enjoy the evening without giving one night of straying too much importance. Once seated, we ordered the entire menu to share. 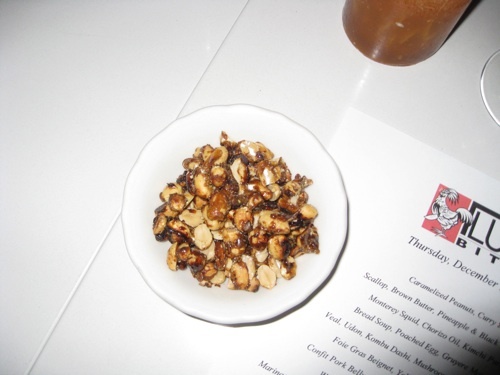 The first thing to arrive was not only the most vegan friendly but a table favorite--Caramelized Curry Peanuts. 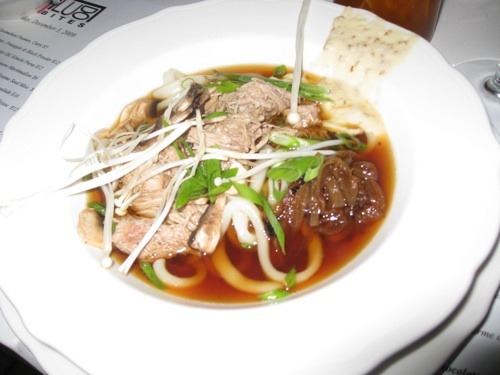 Runner up had to be the Veal Udon--a beautiful dish with complex and hearty flavors. While I avoided eating the actual meat, I hoarded the noodles and slurped the meaty broth without an ounce of guilt. 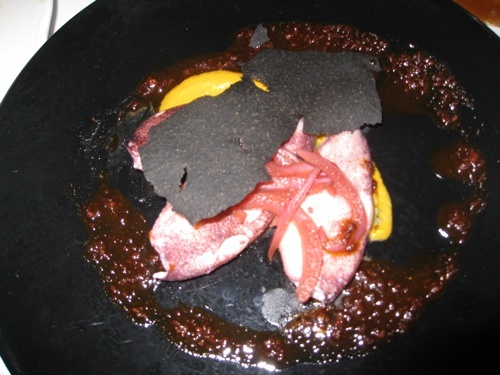 I even tried a bite of squid, which lay in between a drizzle of chorizo oil and a sheet of eggplant paper. A beautiful dish, though perhaps not the one to convert me back to my old ways. 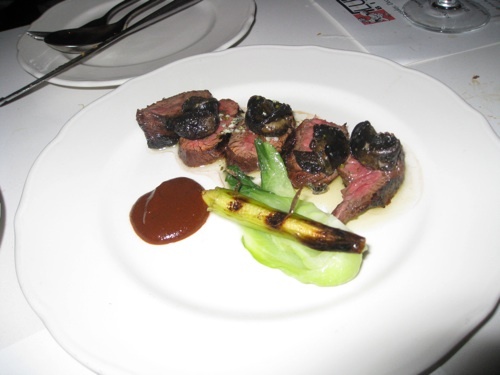 I ate one lone escargot, as well, but avoided the beautifully cooked slices of hangar steak that lay underneath. Fearing the steak itself would endanger my love for my new diet, I kept my distance. Especially after tasting the smoky bread soup. 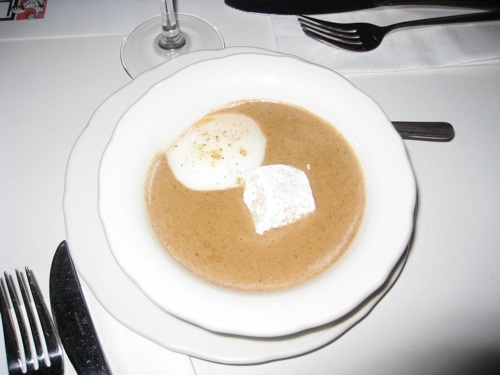 Sure, I avoided the poached egg and the gruyere marshmallow floating atop, but I couldn’t dodge the robust ham flavors in the soup itself. So. Good. Vegans, don’t be mad at me! 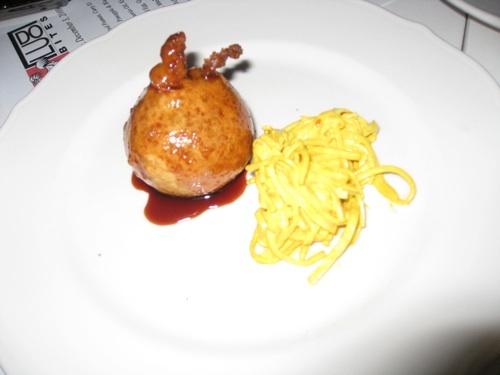 Earlier that day, I asked the twitter world what a vegan should do at LudoBites and Krissy, Ludo’s wife, responded “Hmmm, dive fork first into foie gras beignet.” I wasn’t so bold. Even pre-veganism, I knew that not all that glitters is gold and not all that is tucked inside a doughnut is desirable. My guess is the foie gras beignet isn’t going anywhere, but expect the rest of the menu to change throughout the month. Ludo spent the weekend in Puerto Rico for a Top Chef Masters reunion and will no doubt return home with a plethora of new ideas and fresh inspiration. If you don’t have a reservation, I highly suggest you find someone who does and crash the party. Whether you eat every animal part or no animal at all.